CC Jentsch is a small, family-owned BC winery located on the Golden Mile Bench in Oliver. Amber Pratt is Chris and Betty Jentsch’s winemaker. The family has farmed in the region since 1929. I first learned of their wines when I was a judge at a BC Pinot Noir competition in 2015. Their 2013 Syrah placed first in another competition held the same weekend led by international wine judge, Steven Spurrier. I became a member of their wine club that fall and have enjoyed receiving shipments ever since. Their Viognier is a perennial pleaser; we enjoyed this one on the porch with neighbours. On the eyes, it’s pale lemon with aromas of peach, kernel and dried herb. The palate is dry with good acidity – no flabbiness here – with more Okanagan peach, kernel, and honey, with dried grass and sage. 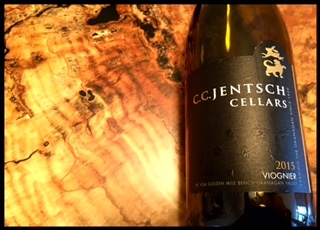 This entry was posted in British Columbia, Viognier, WHITE and tagged 2015, BC, Canadian wine, CC Jentsch, Golden Mile Bench, Naramata VQA, Oliver, viognier, white wine. Bookmark the permalink.